In July of 2005, I wrote about Neeta Ragoowansi, a fabulous singer, musician, and a former entertainment attorney for the Kennedy Center. Neeta continues to use her powers for good, working as the Membership Director of SoundExchange, a nonprofit agency based in Washington, D.C. and authorized by the U.S. Copyright Office to collect royalties from digital broadcasters and pay them directly to performing artists. Founded in 2000 and initially part of the Recording Industry Association of America, SoundExchange made its first payments in 2001 and, after a slow beginning, has begun to double its annual collections. Recently, SoundExchange had come under fire for not doing enough to find those musicians, and see to it they get what they derserve. Those detractors couldn't be more wrong, as the Bakersfield Californian's Robert Price found out. Sound Exchange continues to find artists and their families, and for those that can't be found, their royalties reside in a general fund, to support their fellow deserving artists. In Price's December column, he detailed just how difficult it can be for Sound Exchange to find these artists, and how rewarding it can be when they do. In a recent blogs, SoundExchange was taken to task for not doing enough to get royalties for artists like, T. Bone Burnett, Ton-Loc, Flock of Seagulls. As Neeta explained to me in a phone conversation last week, "That at the time of their release, any unclaimed funds would go towards SoundExchange's operating costs, thereby lowering the administrative fee charged. This would, then, in turn result in a larger payment being made to the featured artists and sound recording copyright owners who are paid by SoundExchange. There have been some artists who, upon hearing this explanation, chose not to claim their funds and opted instead to have their payments in essence redistributed among other featured artist and sound recording copyright owner payees in this manner." A noble way of giving back in the music world if ever there was one. Last December, Price wrote: "Before 1995, U.S. recording artists weren't entitled to airplay royalties of any sort. The Digital Performance in Sound Recordings Act of 1995 and the Digital Millennium Copyright Act of 1998 changed that -- at least for Internet and satellite radio. The nonprofit organization SoundExchange, authorized by the U.S. Copyright Office to collect and distribute royaltiesassociated with those specific media, started with a royalty pool of $5.2 million. About 90 percent of that money has been distributed to thousands of artists worldwide. Of the 9,000 performers identified as eligible in September, the group has located about 2,000. The rest are owed $500,000. "This is just in its infancy and it's expanding every year," said Holland, a former reporter for the music industry weekly Billboard who does contract detective work for SoundExchange. Finding beneficiaries can be tough, though. Take Cooley, the legendary World War II-era Western Swing bandleader and '50s television host who murdered his wife at their Mojave ranch in April 1961. Cooley suffered a fatal heart attack in 1969 while on a furlough from prison -- three months before he was to have been paroled. He left behind a catalogue of up-tempo hits and three children -- Melody, born in 1946; Donnell Jr., born in 1948; and John, a son from his first marriage, born about 1935. The star witness against Cooley was his 14-year-old daughter Melody, who witnessed her mother's fatal beating. "She would be about 60 today," said John Simson, executive director of SoundExchange. "We'd like to talk to her." He'd like to talk to her brothers too. 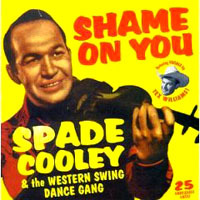 Before Simson gives up, he might want to ask actor Dennis Quaid, who's planning to tell the Spade Cooley story one day with a film called "Shame on You," after Cooley's biggest hit. Quaid purchased rights to the stories of Cooley's children. Simson counts on people like Holland to do most of the legwork. "Best job I've ever had," Holland said. "So many of these so-called heritage artists are just off the radar. They're people who still get airplay on super-hip satellite stations but not so much anywhere else. And most of the time they have no idea they're owed any money." He remembers fondly the day he tracked down the widow of Ernie K-Doe, a New Orleans R&B singer who recorded the Allen Toussaint song "Mother-in-Law." "I've got a couple thousand dollars for your late husband," Holland told Antoinette Fox, who'd been yelling at a delivery man in the kitchen of the Mother-in-Law Lounge when he called. "Child, you just put the Thanksgiving turkey on the table," she replied. Word of mouth is Holland's best tool. It has worked elsewhere -- most recently in Shreveport, La., another country music hotbed. It might start here with Red Simpson, who is best known for his country songwriting prowess but also had moderate success as a recording artist during the late-'60s/early-'70s heyday of the truck-drivin' genre -- none better than 1971's "(Hello) I'm a Truck." "The guy told me they've got eight-hundred-and-something (dollars) for me," Simpson said. "What a great deal. 'Course my wife will probably get it." The efforts of Holland, Ragoowansi, Simson and others on behalf of these performers continues, and in this ever growing electronic age of mp3 downloads, webcasts, streaming audio, the murky history of the recording industry and the struggling independent labels, SoundExchange continues to be a welcome ally to performers and artists all over the world. You can visit SoundExchange at http://www.soundexchange.com. You never know, they just may have some royalties for you.